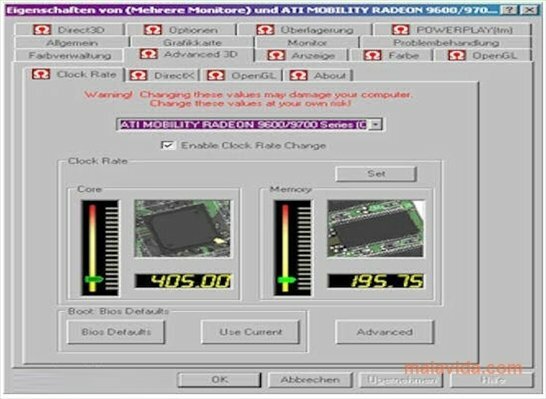 ATI Tray Tools is an application that will allow you to overclock and thoroughly configure your ATI graphic card. If you want to make the most of your ATI graphic card's performance, this software will help you to overclock the GPU, and access the memory and other essential parts of the card (like the connection port). Thus, games that didn't used to work properly will now run without any problems. Using part of the original controllers and obtaining information from the temperature, speed and other sensors, the performance of each card can be configured both for DirectX as well as for OpenGL, changing the speed of its components. Almost anything can be modified, even though you'll run the risk of forcing you hardware too much. 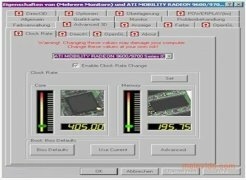 ATI Tray Tools is a very useful tool to overclock ATI graphic cards, but the truth is that it may end up damaging or even burning your motherboard or graphic card. This tool has to be used with precaution and always checking the system stability with each change. Nevertheless, as soon as everything works properly, you'll notice a large change with regard to how certain demanding games and programs are launched.